There are many ways you can draw a path in Inkscape. In the example shown here, I have used the spiral tool, the freehand pencil, and the Bezier pen. At the end of this post, I will discuss additional options. In this example, I started with the spiral tool. Select the spiral tool ( ) from tool icons along the left side of Inkscape. You can adjust the appearance of the spiral with the options along the top of the Inkscape window (see red box below). For information about each of the values that you can change, take a look at Tav Mjong’s Shapes and Spirals Chapter or the FLOSS manual. In the main drawing area, click and hold down the left button on your mouse and drag the mouse to create the spiral on the canvas. When you have the right size, release the mouse button. I drew the rest of the heart, using the freehand pencil tool. Select the pencil icon ( ) from the left side of the Inkscape window. You can adjust how the pencil draws using the options along the top of the window. I used the “Regular Bezier Path” mode and increased the “smoothness” to 58 so that, even though my hand shakes a bit when dragging the mouse, the line is smooth. To find out more about the different modes and settings, have a look in Tav Mjong’s Creating Paths Chapter. Click and hold down the left mouse button and drag the mouse to draw your curve. When you are done, release the mouse button. Don’t worry if it is not perfect; you can change the line after you let go of the mouse. I will show you how later on in this tutorial. Note: If you are going to do a lot of freehand drawing, you might want to consider getting a graphics tablet. We now have a spiral and a curve but, for drawing the zigzag pattern, we need them to be connected together. Select both the spiral and the freehand curve. To do this, click on the Select and Transform tool ( ). To select more than one object, you can hold down the Shift key and click on each object, alternatively, you can click and drag the mouse to create a box around both objects (Note: no part of the object can be outside the box). You should see a dashed box around both objects. From the top menu, select Path -> Combine. Now you should just see one box around both items. Now we can modify the path to get rid of any wobbles. Select the Edit Path by Nodes tool ( ). When you select a path, it will display little gray squares or diamonds along the path – these are called nodes. The nodes control the appearance of the path. You can change the position of a node by clicking on it and dragging. You can also change how much the path curves by clicking on a node and pulling on the two little whiskers that appear by the node . You can also add or remove nodes as well as many other options, too many for me to explain in this tutorial. I recommend having a quick look at Tav Mjong’s Path Editing Chapter or in the FLOSS manual. Now that you have the path that you want the tape to follow, it is time to add nicely spaced zigzag lines showing where to put the pins. The first step is to create one copy of the “zig” (or is it a “zag”?). I used the Bezier pen tool to do this. Start by selecting the pen tool ( ). To create lines with this tool, click and release the left mouse button at each point in the path you are drawing. A straight line will join the nodes together. To finish the path, double click. You can find out more about the Bezier pen tool from Tav Majong’s: Creating Paths Chapter or the FLOSS manual. To create the zig, draw an upside down V shape (see below). First, select the path editing tool ( ). Next, select Object -> Align and Distribute from the top menu bar of Inkscape. This will open a little toolbox on the right side of the Inkscape window. Click on the Λ to select it. Drag your mouse to select the two little grey boxes at the bottom of the Λ. The boxes should turn blue. Click on the “align to horizontal line” icon (see below) to make the two points line up. Now drag your mouse to select all of the boxes in the Λ and click on the “distribute horizontally” icon (see below). Now the space between the points should be the same. To find out more about the alignment tool, see Tav’s Align Chapter. OK, now we have a very nice “zig” so let’s use it. Select the Λ and copy it to the clipboard (Edit -> Copy). Select the path you drew for the tape. From the top menu bar, click on Open -> Path Effects… This will open a toolbox, called “Path Effects”, on the right side of the Inkscape window. Click on the Plus sign ( ) in the “Path Effects” tool box. A list will pop up. Scroll down the list and click on “Pattern Along Path” and click on the Add button below the list. Click on the “Link to path on clipboard” button ( ). Change the “Pattern copies” to “Repeated”. Now you should see zigzags along the path. You can adjust the size of the zigzags by changing the original Λ. Choose the Selection tool ( ), click on the Λ and drag the corners of the dashed rectangle ( ) to make the Λ bigger or smaller. If you hold down the Ctrl key while dragging the box, the width and height will scale proportionally. You can also move the zigzags along the path (maybe you don’t like the way the zigzag looks at the bottom point of the heart) by changing the value of “Tangent offset”. To learn about more tricks, take a look at Tav’s Pattern Along Path Chapter or the Floss manual . OK, you have played around with the Pattern along path and it is pretty good but you still want to change it a little bit. As a last step, you can turn the pattern along path into an editable path object. Using the selection tool, select the zigzag path and from the top menu choose Path -> Object to Path. This will turn all of the little zigzags into a path with individual nodes. You can now edit individual nodes the same way we did in Step 2 above. I didn’t like the way the zigzags became rounded so I went into the Edit Path by Nodes tool ( ), selected all of the nodes (Ctrl A or drag a rectangle around everything) and clicked on the “Make selected nodes a corner” ( ) option (see A below). This made all of the lines straight. I also dragged some of the nodes so that the different parts of the spiral would be connected together (see B below). Finally, I wanted a curve along the inside and outside of the tape. I drew this using the Bezier pen tool ( ) similar to what we did in Step 3. I wanted the curve to lie exactly on the nodes of the zigzag so I used Inkscape’s snap to target feature which appears along the right side of Inkscape. This feature has many options so I recommend reading up about it in Tav’s Snapping Chapter. I used “Snap to cusp nodes”. There are many other ways to draw a path. You can draw a shape and convert it to a path. This is very useful if you want to combine circles (or parts of circles) with triangles, squares etc. I recommend reading Tav’s Paths from Objects Chapter. Instead of zigzags, you could also place dots along a path using the “Pattern along path” technique discussed in Step 3. Just replace the Λ with a circle. Notes: You will need to convert the circle to a path. You will need to set the “Spacing” parameter in the Path Effect Editor to create a gap between the dots. Create a rectangle of lace ground pattern that is bigger than shape. For example, below I create a rectangle of rose ground that is 120mm by 120 mm. Select the entire rectangle by dragging your mouse to form a box around it. Notice there is a little bar at the bottom of the window and it shows what you have selected. In the picture below, I have selected 1536 little lines, each line is called a “path”. Each little line is surrounded by a thin black dashed box. We need to group all of these little lines together so that we can treat them as one object. To do this, select Object -> Group from the top menu of Inkscape. Notice that now there is just one thin black dashed box around all of the lines and the text at the bottom of the window says “Group”. Create the shape that you want to fill in with the ground pattern. In the example below, I have drawn a star using the “Stars and polygons” tool. To learn more about drawing stars and other shapes, you can visit the following Inkscape tutorial: shapes tutorial. NOTE: If you want to create a Gimp outline or a tape outline as I did above, you need to create a second copy of your shape. You can do this using the copy and paste menus. Drag the shape on top of the ground pattern and position it so that the ground lines up with the shape exactly as you want it to. Select both the shape and the group containing the ground pattern. Now select Object -> Clip from the top menu. You will be left with just that part of the ground inside the outline as shown below.If this does not happen, there are a couple of things to check: 1) Make sure that you have grouped the ground pattern together as described in step 2. 2) Make the shape is ON TOP OF the ground pattern. If the shape is behind, you can select the shape and press the “Home” key on the keyboard. This should bring the shape to the top. 3) Make sure the shape is not grouped together with the ground pattern. Position the second copy of the shape around the pattern. You can use the alignment tool to help make the alignment perfect (reference on how to use the alignment tool). Several steps are required to create the zigzag tape so I will cover this in a separate blog post (Creating a tape). On my Inkscape extensions page, locate the extensions.zip file (Step 2 on that page) and click on it to download. The file is called extensions.zip and it is a compressed file. Launch Inkscape and go to the top level menu “Edit” -> “Preferences”. A window will pop up and you will probably have to drag the bottom right corner to resize it in order to see everything. On the left side, scroll down to “System” and click on it. On the right side, find “User extensions” and copy the text that appears in the white box beside this label (see below). Open the application and navigate to the downloaded extensions.zip file. Select extensions.zip. With the right mouse button, launch the file explorer menu and select “Open with” -> “Windows Explorer”. This will list all the files in extensions.zip (see below). At the top right of the window, there is an icon with the label “Extract All”. Click on it. This will launch a new dialog window called “Extract Compressed (Zipped) Folders. Here, enter the name of the folder that you copied in Step 2 above. Finally, click on the “Extract” button in the bottom right corner of the dialog window. Close Inkscape if it is currently running. Next time you open Inkscape, the updated extensions will be running. Inkscape does not run directly on the Mac OS X operating system. It uses a go-between called XQuartz. Nothing to be concerned about, but there are a few things you should be aware of. To install Inkscape on Mac OS X, follow the instructions given here: Inkscape Extensions for Bobbin Lace. NOTE: You will need to install XQuartz first and restart your computer as per the instructions in the link. The left one in the red box is for Inkscape and the right one is for XQuartz. Inkscape runs “inside” the XQuartz application. The top menus for Inkscape are a little different from what you are used to for applications on Mac OS X. Instead of being at the very top of the screen, they are located at the top of the main Inkscape window. The top of the screen will show the XQuartz menus and below that, in another window, you will see the Inkscape menus. Where did it go?!?! If you minimize Inkscape, usually you can make it come back by clicking on the Inkscape icon in the application bar. If this does not work, click on the XQuartz icon in the application bar and from the top menu of XQuartz select “Window -> YOUR DOCUMENT NAME – Inkscape. As of Inkscape 0.92, the Inkscape keyboard shortcuts use Ctrl (^) instead of Cmd (⌘) as a modifier key for commands such as Copy (Ctrl C) and Paste (Ctrl V). Hopefully, this will be fixed in future releases. Download the file “extensions.zip” from Inkscape Extensions for Bobbin Lace. Launch Inkscape and go to the menu Edit -> Preferences. A window will pop up and you will probably have to drag the bottom right corner to resize it in order to see everything. On the left side, scroll down to “System” and click on it. On the right side, find “User extensions” and copy the text that appears in the white box beside this label (see below). In the window that pops up, paste the path you saved in step 2 and click on the “Go” button. Finder will take you to this folder location. Drag the files you downloaded in Step 1 into the folder you opened in Step 4. Download the “templates.zip” file from Inkscape Extension for Bobbin Lace Grounds and copy the files to a folder where you like to keep your lace documents. In Finder open the folder that contains the lace template files. Select the text (.txt) file for the template you want to use (NOTE: There is also a .png file with the same name. Make sure you select the .txt file). For example, select the “rose.txt” file if you want to create some Rose ground. While holding down the OPTION key, click on the right mouse button to open the context menu for this file and select “Copy rose.txt as Pathname” as shown below. 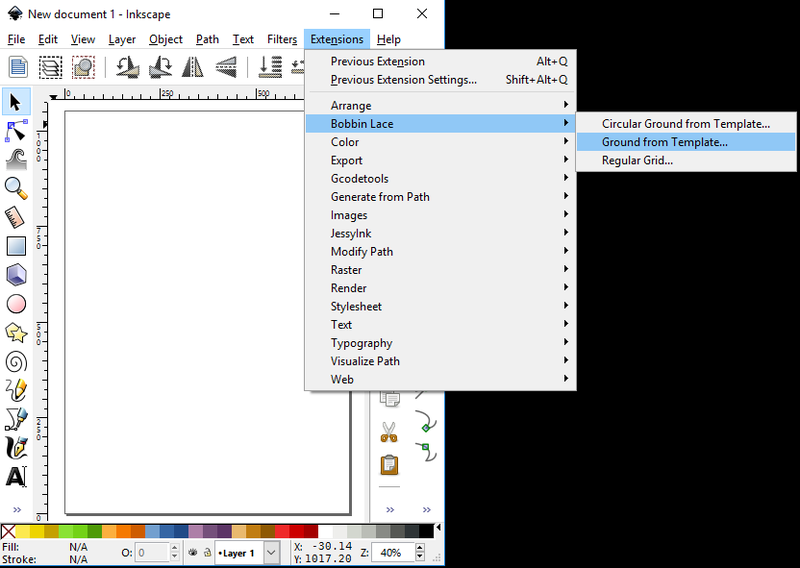 In Inkscape, go to the Extensions top level menu and select Extensions -> Bobbin Lace -> Ground from Template. A window will pop up as shown below. In the white box to the right of the “File name for ground template (full path)” label, paste the path name you copied in Step 3. Because Inkscape uses XQuartz, the clipboard is a little different. You have set-up the clipboard on XQuartz correctly. From the XQuartz menu at the top of your screen, select XQuartz -> Preferences. Make sure there is no checkbox beside the item “Update Pasteboard when CLIPBOARD changes”.